Welcome to the Computer Graphics Group at RWTH Aachen University! The research and teaching activities at our institute focus on geometry acquisition and processing, on interactive visualization, and on related areas such as computer vision, photo-realistic image synthesis, and ultra high speed multimedia data transmission. In our projects we are cooperating with various industry companies as well as with academic research groups around the world. Results are published and presented at high-profile conferences and symposia. Additional funding sources, among others, are the Deutsche Forschungsgemeinschaft and the European Union. Prof. Kobbelt has been named RWTH Fellow for his outstanding research performance and his great merits for RWTH Aachen University . We have a paper on String-Based Synthesis of Structured Shapes at Eurographics 2019. We have presented a paper on Correspondence Learning on Unstructured 3D Meshes at the ECCV 2018 Workshop GMDL. We have a paper on Interactive Curve Constrained Functional Maps at the Eurographics Symposium on Geometry Processing 2018. We have a paper on Feature Curve Co-Completion in Noisy Data at Eurographics 2018. On November 3–5 we will be staging the Geometry Lab: an event where works of art meet scientific exhibits. Located in the Ludwig Forum art gallery, the exhibition displays an entire spectrum from classical geometric phenomena to modern research areas. In addition, workshops will be held for participants to fold paper into fascinating forms, build complex structures with Zometool, or even assemble their very own 3D printer. Despite high practical demand, algorithmic hexahedral meshing with guarantees on robustness and quality remains unsolved. A promising direction follows the idea of integer-grid maps, which pull back the Cartesian hexahedral grid formed by integer isoplanes from a parametric domain to a surface-conforming hexahedral mesh of the input object. Since directly optimizing for a high-quality integer-grid map is mathematically challenging, the construction is usually split into two steps: (1) generation of a surface-aligned octahedral field and (2) generation of an integer-grid map that best aligns to the octahedral field. The main robustness issue stems from the fact that smooth octahedral fields frequently exhibit singularity graphs that are not appropriate for hexahedral meshing and induce heavily degenerate integer-grid maps. The first contribution of this work is an enumeration of all local configurations that exist in hex meshes with bounded edge valence, and a generalization of the Hopf-Poincaré formula to octahedral fields, leading to necessary local and global conditions for the hex-meshability of an octahedral field in terms of its singularity graph. The second contribution is a novel algorithm to generate octahedral fields with prescribed hex-meshable singularity graphs, which requires the solution of a large non-linear mixed-integer algebraic system. This algorithm is an important step toward robust automatic hexahedral meshing since it enables the generation of a hex-meshable octahedral field. 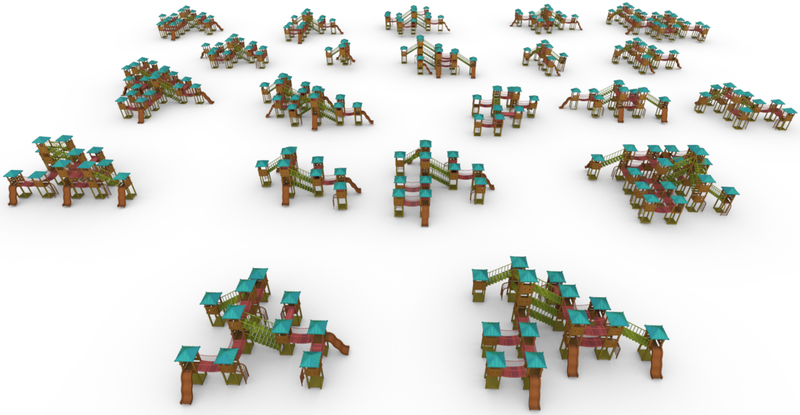 Functional maps have gained popularity as a versatile framework for representing intrinsic correspondence between 3D shapes using algebraic machinery. A key ingredient for this framework is the ability to find pairs of corresponding functions (typically, feature descriptors) across the shapes. This is a challenging problem on its own, and when the shapes are strongly non-isometric, nearly impossible to solve automatically. In this paper, we use feature curve correspondences to provide flexible abstractions of semantically similar parts of non-isometric shapes. We design a user interface implementing an interactive process for constructing shape correspondence, allowing the user to update the functional map at interactive rates by introducing feature curve correspondences. We add feature curve preservation constraints to the functional map framework and propose an efficient numerical method to optimize the map with immediate feedback. Experimental results show that our approach establishes correspondences between geometrically diverse shapes with just a few clicks.